Blood Splattered Cinema: @CryptTV will summon your inner Krampus! @CryptTV will summon your inner Krampus! 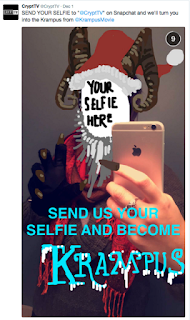 Send your selfie to @CryptTV on Snapchat, and they'll turn you into KRAMPUS. Best six will then be released on @CryptTV for everybody to see! Follow @CryptTV for more details and use #CryptFamily to let them know what you think!